Even though “reentry” typically refers to the time after a person is released from prison or jail, the reentry process really begins on the inside, prior to release. Some would say reentry planning should start the moment a person is sentenced, as it can take months or years for an incarcerated person to prepare for life back in the community. This means planning and preparing for the emotional and physical support systems required in reentry—safe and affordable housing, health care, employment, family support, and so on. One recent change in our health care laws is bringing this principle to life—a ray of hope for people in jails preparing for reentry! In 2010, President Obama signed the Affordable Care Act (“Obamacare”) into law. Many of its provisions took effect just last month on January 1, 2014. 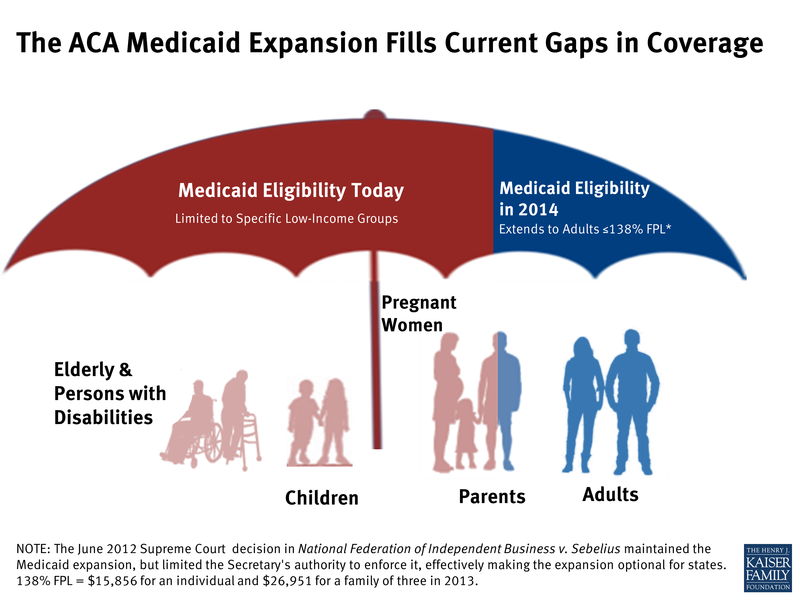 One of the most powerful changes that Obamacare made to health coverage was the expansion of Medicaid eligibility to more of our nation’s poorest citizens. As Bloomberg reports, “Obamacare replaced a hodgepodge of state requirements that typically excluded childless adults from Medicaid. The 2010 law opened it to anyone making less than 138 percent of the federal poverty level, about $16,000 for an individual.” Many of the people in prison and jail fall within the expanded eligibility based on income, and 25 states—including California—have expanded their state Medicaid programs to include this newly eligible population. In particular, more and more counties in these 25 states are looking to jail-based programs to begin enrolling eligible people into Medicaid, so that a person can walk out of jail with health care coverage. Policies like this serve everyone: they help many currently and formerly incarcerated people access consistent health care and avoid emergency rooms when they get out; they help states save money on health care by taking advantage of federal money; and they help some of our nation’s poorest in jail and prison stay healthier and less likely to end up back in jail or prison once they get out. Reentry must begin on the inside. Read more about Medicaid enrollment programs in jails here and here. Learn more about the expansion of California’s Medicaid (called Medi-Cal) program here and here. We hope to see more jails and prisons adopting procedures and policies for getting people eligible for Medicaid covered before they walk out the door! Among the 2.3 million people incarcerated in the United States today, more than half are parents. The stats are staggering: one in 28 American children has a parent behind bars. Earlier this week, the New York Times published perspectives on a new development of video-facilitated prison “visits” behind bars. What are the pros and cons of these visits? How do you feel about them? We share some of our own thoughts on the subject here. A recurring theme in this blog, and in our work, is that reentry is a long-term process, and thus preparation for it must begin far before the day of release. For a person to transition successfully from prison to community life, he or she needs social, emotional, and material support on an ongoing basis. Family connections are a vital source of this critical support. For many people in prison, connections with loved ones serve as powerful motivators to improve themselves and rebuild their lives on release. But keeping these connections alive can be extremely difficult, for both families on the outside and people behind bars. Many people are housed hundreds of miles from their families — and, in California’s overcrowded system, transferred to out-of-state facilities. People have no right to be housed near family. As a result, families undertake costly and arduous journeys in order to see loved ones. For families who make can make the trip, visits and “hellos” aren’t what they might hope or envision. Spouses are often prevented from expressing ordinary forms of physical affection– hugging, touching, holding hands, because of glass barriers and institutional rules. Children, too, are prevented from touching, kissing, and hugging a parent. Instead, they have to communicate with their incarcerated parent in a stark and intimidating correctional context. Very often, children have trouble connecting with their incarcerated parent, feel intimidated by the correctional institution, and dread these visits, instead of looking forward to the chance to see mom or dad. For families who can’t afford the time or money to visit, relationships with incarcerated loved ones suffer and often deteriorate. Families on the outside feel the collective stresses of social stigma in their communities and physical separation from their loved ones. Many incarcerated and formerly incarcerated people that Root & Rebound works with report that, while their families visited once in a while early on, they stopped getting visits because of the huge emotional and financial strains on family, and resentment built up on both sides. When these people get out, they have lost ties with family and have no where to look for support. But social science shows us that we need family visits to happen as often and easily as possible: when family visits occur more regularly, incarcerated parents are more likely to succeed and less likely to reoffend upon release. Even more, their children do better socially, emotionally, and academically. As human beings, we all know that being mothers, fathers, sisters, and brothers makes us better people, more grounded, and better equipped to problem solve and deal with emotional challenges. And yet fewer than half of incarcerated parents receive visits from their children. How can the increasing use of video visits in prison improve this situation? We believe that they have the power to do good for families, to strengthen ties and connections, and to ensure that when people get out, they have emotional support. Yet they can also be exploited and overused by prisons and jails. Some clear pros of video visits are that they help incarcerated people sustain relationships with loved ones who, for medical or financial or other reasons, cannot easily visit. They keep communications going. This is an incredible tool for families who are far away from their loved one, and for the incarcerated people desperate to see their children and spouses more regularly.Yet no video can replace the feel of a hug from your mother or father, or the opportunity to play with your child, and it would be a shame if prisons ever replace the option of real, live in person visits for video conferencing only. Yet some video-conferencig companies, eager to make a bigger profit, are pushing prisons and jails to completely replace in-person visits with video visits, and are charging huge rates–$1 per minute or more. Therefore, like any tool in this world, video-conferencing can be used for good– it can be an incredible tie that binds families who would otherwise disconnect over time. But, as with any tool that is being offered by big corporations for disenfranchised communities with little means and little voice, we as advocates must be sure that video-conferencing is not used to exploit the most vulnerable people who need family and connection to survive. These are just some of our thoughts. Please share yours hear in the comments section, and read more thoughts on the topic at Room for Debate: Visiting Prisoners, Without Visiting Prison. FOR CLIENTS: Speed Screening interviews are one-on-one interviews to review your rap sheet and determine whether your conviction(s) can be dismissed. Please bring your rap sheet for an individual interview regarding “next steps” in the expungement process. The waiting list for court representation by the Record Clearance Project currently is closed. Please let them know one week in advance of the session if you are coming to a Speed Screening by emailing expunge@sjsu.edu (e-mail is preferred) or leaving a message at (408) 924-2758. The clinic may not be able to assist people on a walk-in basis who have not called ahead. A voluntary, $10 donation is requested. All services are free to low-income people. Learn more about SJSU Record Clearance Project ONLINE and follow them on FACEBOOK. Monday — 9:30 a.m. – 11:00 a.m.
Tuesday — 1:00 p.m. – 4:00 p.m.
Thursday — 1:00 p.m. – 4:00 p.m.
Friday — 9:30 a.m. – 11:00 a.m. Please let anyone you know who could be eligible for expungement and lives close to the South Bay know about these services! ROOT & REBOUND IS HIRING! Seeking a full-time Administrative & Development Assistant as a wonderful addition to the R&R Team. Please feel free to share widely and with your networks. Find the job announcement here: http://tinyurl.com/m39fnme. Root & Rebound is a Reentry Advocacy Center dedicated to improving the lives of reentering citizens and maximizing their opportunities for success in the community. Root & Rebound provides a range of programs and services for individuals and communities through direct legal and social services, legal education, and policy advocacy. Founded in October of 2013, Root & Rebound is focused on bringing an innovative and creative approach to solving the current crises in reentry in the Bay Area, in California, and beyond. Commitment: Full-time, starting March 2014. Position Description: The Administrative and Development Assistant will coordinate and manage the administrative operations, communications, and development activity of the organization. This position also entails front desk and reception area coverage. Ability to comfortably and appropriately communicate with a diverse group of stakeholders including formerly incarcerated clients, staff, community partners, board members, and others. This position is offered as a full-time position. The salary range for this position will be discussed with candidates upon being invited to interview. After three month trial period, this position will include medical, vision, and dental health benefits. To apply for this position, please send a resume, cover letter, short writing sample, and at least two references with contact information in an email to Katherine Katcher (Executive Director) at kkatcher@rootandrebound.org. Resumes without a cover letter, writing sample, and references will not be reviewed. No fax or mail applications and no phone calls, please. Applications must be submitted by March 3, 2014. Root & Rebound is an equal opportunity employer and strongly encourages applications from all qualified individuals including women, people of color, people with conviction histories, persons with disabilities, ethnic and religious minorities, and lesbian, gay, bisexual, transgender, and gender variant individuals. What is the consequence of a criminal justice system that continues to dish out longer and harsher sentences? One answer to that question, which we don’t always think about, is that thousands of people are growing old behind bars. From overly punitive mandatory sentencing schemes to aggressive prosecutorial decisions to unsympathetic courts, we have watched prison populations balloon and people are being locked up for longer than ever before. Many people face the reality of dying in prison. In 2007, for example, 46% of people aged 55 in state prison died behind bars. Right now, 1 in 10 state prisoners is serving a life sentence and 11% are serving sentencing longer than 20 years. What does this mean for them? A few weeks ago, Human Rights Watch came out with a report about the aging prison population called “Old Behind Bars.” As they describe the problem, “Prisons in the United States contain an ever growing number of aging men and women who cannot readily climb stairs, haul themselves to the top bunk, or walk long distances to meals or the pill line; whose old bones suffer from thin mattresses and winter’s cold; who need wheelchairs, walkers, canes, portable oxygen, and hearing aids; who cannot get dressed, go to the bathroom, or bathe without help; and who are incontinent, forgetful, suffering chronic illnesses, extremely ill, and dying.” And as Colorlines’ infographic (at top) shows, Blacks and Latinos are overrepresented throughout the prison population, including among the elderly. It is inhumane to keep ill and elderly people locked up when they pose virtually no risk to public safety, especially when those prisons aren’t equipped to provide geriatric care or daily living assistance to the elderly. It’s a huge financial cost to the states and an even larger cost to the humanity of our society to have people aging behind bars. We are thrilled to announce that Root & Rebound now has fiscal sponsorship by a wonderful sister organization, the Prison University Project. That means that Root & Rebound can accept tax-deductible donations as we await determination of our tax-exempt status! We are so grateful to PUP for supporting our work and efforts in this way. Today, we begin our Founding Donors Campaign. Every donation, whether $5 or $500 will allow us to launch our work providing reentry legal services, “know your rights” reentry legal education, and policy advocacy in the Bay Area, California, and beyond. DONATE HERE: https://donatenow.networkforgood.org/prisonuniversityproject and again, be sure to mention Root & Rebound. To Donate by check: please write a check to “Prison University Project,” with a note indicating “For Root & Rebound.” Please mail checks to: Prison University Project, PO Box 492, San Quentin, CA 94964. Thank you for taking a stand for civil and human rights by supporting our work! “The right to vote is the foundation of any democracy, yet nearly six million Americans are denied that right, in many cases for life, because they have been convicted of a crime. Some states disenfranchise more than 7 percentof their adult citizens. In an unflinching speech before a civil rights conference Tuesday morning, Attorney General Eric Holder Jr. described this shameful aspect of our justice system for what it is: a “profoundly outdated” practice that is unjust and counterproductive. Felon disenfranchisement laws lie at the intersection of two issues on which Mr. Holder has become increasingly outspoken: criminal justice reform and voting rights. While he has no direct authority to change state laws, the weight of his words can help pave a path for legislative action in both Congress and statehouses around the country. In recent years, many states have made it easier to regain the right to vote after a conviction, either through legislation or by executive action. But a handful of states, particularly in the South, continue to be guided by the ghosts of the post-Civil War era, when disenfranchisement laws were aimed at newly freed blacks. The brunt of today’s laws that prohibit felons from voting still falls disproportionately on minorities, who make up more than one-third of those affected. In Florida, Kentucky and Virginia, more than one in five African-Americans cannot vote because of a conviction. Despite some progress, the United States remains an extreme outlier in allowing lifetime voting bans. Most industrialized nations allow all nonincarcerated people to vote, and many even allow voting in prison. Adding insult to injury, felon disenfranchisement laws — which are explicitly permitted by the 14th Amendment to the Constitution — are devoid of both logic and supporting evidence. They undermine the citizenship of people who have paid their debt to society, and possibly at a cost to public safety. As Mr. Holder pointed out, a study by a parole commission in Florida found that formerly incarcerated people banned from voting were three times as likely to re-offend as those who were allowed to vote. Mass disenfranchisement also has serious political consequences. According to a 2002 study, disenfranchisement laws may have determined the outcome of seven Senate races — and thus control of the Senate throughout the 1990s — and a presidential election. While George W. Bush won Florida by 537 votes in 2000, more than 800,000 Floridians with criminal records were barred from voting. Thank you, NY Times Editorial Board, for arguing against the injustice of continued punishment and disenfranchisement of people who have served their time, and the ways that our laws prevent returning citizens from reintegrating into their communities and becoming an engaged part of civil society. This image is part of photographer Amy Elkins’ project “Parting Words.” It portrays Franklin Alix, a man on Texas’ death row who was executed on March 30, 2010 at age 34. Here at Root & Rebound, we could not be happier to see criminal justice reform and reentry issues making top national headlines. We feel it is important to share the writing and work of others in this field. Please check out some of the amazing things happening around our country—in art, politics, and journalism—all centered on fixing our broken criminal justice system and the barriers that face people coming out. California-based photographer Amy Elkins has launched an incredible and haunting online visual archive of the more than 500 people on Texas’ death row who have been executed since the state’s death penalty was reinstated in 1976. 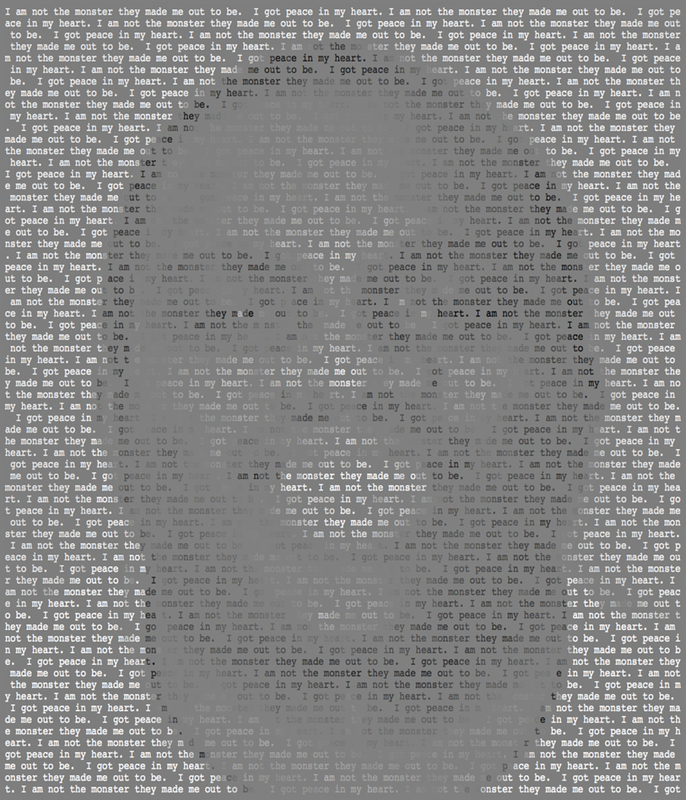 These portraits overlap executed individuals’ mug shots with their last words as provided on the Texas Department of Criminal Justice’s Web page. On the Department’s “Executed Offenders” page, members of the public can scroll through the names, ages, prison IDs, race, convictions and last statements of the people in prison sent to death, in chronological order. At the time Elkins stumbled upon the website, it listed 440 men and women. Today, it lists 510. Kristof’s op-ed in the New York Times this weeks describes how jails and prisons have become “de facto mental health hospitals,” calling this “inhumane” and “deluded.” Root & Rebound agrees. Many people struggling with mental illness and disorders have nowhere to go, can’t afford medicine outside of jail or prison, and are arrested and criminalized for behaviors and acts that often flow from their mental illness. When people facing mental health challenges are released, we do not have a social or legal system built up to support them; instead we funnel money back to incarceration instead of dealing with the problem from a fiscally and socially responsible services-based standpoint. Last month, Root & Rebound shared the exciting news that the deputy attorney general, James Cole, of the Department of Justice, was searching for suitable candidates for clemency, specifically people with nonviolent, low-level drug offenses who are serving “life or near-life” sentences that are considered excessive under current law. (R&R has also written about excessive sentencing laws here and here.) In tandem with changes to federal drug sentencing laws, we applaud the Justice Department’s renewed interest in the President’s clemency powers, “designed so that the President could commute unjust sentences or pardon deserving petitioners who had served their time.” These signals from the federal government are important–there is new recognition that our system of incarceration in this country is seriously flawed and that mercy for people behind bars and people coming out of incarceration is a concept deserving of our country’s attention. At Root & Rebound, we are working hard to create useful information on reentry to be shared with the public, with practitioners and advocates, and with people living behind bars. So to learn that the incredible talent of Bill Keller, a columnist at The New York Times and its former executive editor, is building and directing The Marshall Project, a nonprofit startup journalism and news source dedicated entirely to issues of criminal justice, is nothing short of fantastic!! In addition to Keller’s talent, the Marshall Project has a projected budget of $5 million a year, paying for a staff of about 30. Keller said the site would include “strong original journalism” as well as an “aggregation of interesting research and interesting voices, including voices from inside prison.” It is intended to be, he said, “a bit of a wake-up call to a public that has gotten a little numbed to the scandal that our criminal justice system is.” We are so excited for this upcoming project to take flight and to see the great resources going into criminal justice reform and news. Maybe one day, R&R and The Marshall Project can collaborate! During a speech at a criminal justice reform symposium hosted by The Leadership Conference on Civil and Human Rights at Georgetown University Law Center, Attorney General Eric Holder called laws taking away the right to vote from people with felony records “unnecessary and unjust” and rooted in “centuries-old conceptions of justice that were too often based on exclusion, animus, and fear.” Such laws disenfranchise millions of Americans, disproportionately impacting Black and Latino men. Voter disenfranchisement laws are one of the many political tools used to keep people locked out of society after coming out of prison. We believe that all people, including those with felony convictions, deserve to have a voice in the political process and are extremely proud to see Attorney General Holder acknowledging this on a public platform. Happy reading! Please free to share other interesting news stories on reentry and criminal justice as well as your comments and feedback with us below…. Logo Colors & Reader Poll! Starting a nonprofit is tough, grueling, and sometimes, not so fun. Working on getting insurance policies, filing legal documents, and filling out IRS forms? Not that fun. Which one is your favorite? 1, 2, 3, or 4? In a few days, Root & Rebound will celebrate 4 months since we opened! As a startup nonprofit, R&R could not be where it is today without the extraordinary help of pro bono lawyers from all around the Bay Area. How did we find lawyers willing to help out Root & Rebound for FREE??? First, we reached out to our contacts from undergrad and law school. Through a friend-connection at Wilson Sonsini Goodrich & Rosati, two of their fabulous lawyers volunteered their time to help Root & Rebound prepare its IRS application for 501(c)(3) tax-exempt status. We couldn’t have asked for a better experience working with volunteer business law attorneys: they explained each and every component of the 501(c)(3) application and meticulously reviewed R&R’s answers. Around the same time, a friend from Berkeley Law School who helped kickstart the not-for-profit Family Violence Appellate Project told us to check in with the Bar Association of San Francisco for pro bono legal help… Look no further! The SF Bar—through its own nonprofit, the Justice & Diversity Center (JDC)—provides pro bono (free!) legal and related social services to low-income and homeless San Francisco residents and to nonprofit organizations that serve these communities through the Community Organization Representation Project (CORP). CORP‘s mission is to provide free business law services to nonprofit organizations (like Root & Rebound!) that directly serve low-income and underserved communities in Northern California. The eligibility requirements are simple and straightforward: CORP assists 501(c)(3) nonprofit organizations (and nonprofit organizations applying for 501(c)(3) status) that are based in Northern California, that directly serve low-income individuals and communities in Northern California, and have a budget of under $5 million. CORP took on Root & Rebound as a client in December, and we have already received so much invaluable legal assistance from their panel of pro-bono attorneys– experienced business law attorney volunteers who provide pro bono transactional legal services in employment, corporate, contract, real estate, tax, and intellectual property law to qualifying nonprofit organizations. What kind of pro bono assistance have we received? Well, it crosses the gamut, as CORP and its attorneys have met so many of our legal needs. An attorney at Cooper, White & Cooper LLP reviewed Root & Rebound’s fiscal sponsorship agreement (an agreement that allows us to accept tax-deductible donations while we await our 501(c)(3) status determination) and helped us negotiate its terms; a volunteer attorney from Latham & Watkins LLP reviewed our incorporation documents and amended them, developed Board resolution templates, will be recording minutes for our first-ever Board meeting this week, and is providing other legal support to the R&R Board; and most recently a volunteer attorney Haight, Brown & Bonesteel LLP who is providing counsel on R&R’s risk management and professional insurance needs. These attorneys have already dedicated many hours of pro bono services to Root & Rebound, treated us with the utmost respect and professionalism, and provided us with thousands of dollars worth of quality free legal services and counsel pertaining to R&R’s business and transactional law needs. i.e., workshops on best practices relating to political activity, employees’ use of social media, etc. CORP is unable to assist with litigation matters. If you are in the Bay Area and believe your nonprofit may qualify, visit CORP’s website here and apply. If you are a nonprofit leader outside of Northern California, we encourage you to check with you local bar association to see what services, if any, they provide to nonprofits like yours. You might be surprised at the resources right under your nose!